St John's Gate is one of the few tangible remains from Clerkenwell's monastic past; it was built in 1504 by Prior Thomas Docwra as the south entrance to the inner precinct of the Priory of the Knights of Saint John - the Knights Hospitallers. The substructure is of brick, the north and south façades of stone. 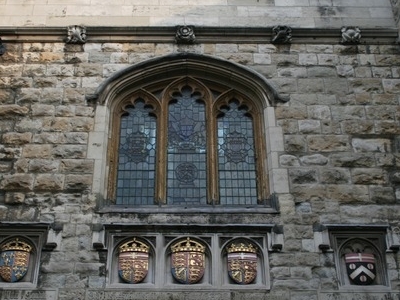 After centuries of decay and much rebuilding, very little of the stone facing is original; heavily restored in the 19th century, the Gate today is in large part a Victorian recreation, the handiwork of a succession of architects - William P. Griffiths, R. Norman Shaw, and J. Oldrid Scott. The building has many historical associations, most notably as the original printing-house for Edward Cave's pioneering monthly, The Gentleman's Magazine, and sometime workplace of Samuel Johnson. From 1701-1709 it was the home of the painter William Hogarth who was just a child at that time. In 1703 his father Richard opened a coffee house there, 'Hogarth's Coffee House', offering Latin lessons together with the coffee. For many years the building was used as a tavern. The Gate was acquired in the 1870s by the revived Order of St. John and was gradually converted to serve as headquarters of both the Order and its subsidiary, St. John Ambulance. It now also houses the Museum of the Order. Much of its Tudor-style interior, including the Council Chamber over the Arch, can be attributed to Scott's renovations in the 1880s and 1890s. St John's Gate has been voted an iconic landmark to represent Islington for the London Olympics 2012. Here's the our members favorite photos of "Landmarks near London Borough of Islington". 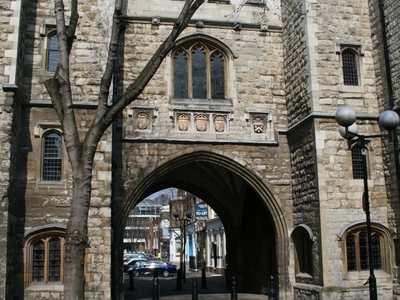 Upload your photo of St John's Gate!